Looking back at the nineteenth century and letting its great men pass before the mind’s eye, we can observe an amazing thing about the figure of Friedrich Nietzsche, something that was hardly noticeable in his own time. All the other outstanding personages, including Wagner, Strindberg, and Tolstoy, reflect to a certain degree the color and shape of those years. Each of them was somehow bound up with the shallow optimism of the progress-mongers, with their social ethics and utilitarianism, their philosophy of matter and energy, pragmatism, and “adaptation”; each of them made sacrifice after sacrifice to the spirit of the time. Only one person represents a radical departure from this pattern. If the word “untimely,” which he himself coined, is applicable to anyone at all, then it is Nietzsche. One searches in vain throughout his whole life and all of his thought for any indication that he might have yielded inwardly to any vogue or fad. In this respect he is the antithesis of, and yet in some ways profoundly related to, the second German of modern times whose life was one great symbol: Goethe. These are the only two notable Germans whose existence has profound significance apart from and in addition to their works. Because both were aware of this from the beginning and continually gave utterance to this awareness, their existence has become a treasure for our nation and an integral part of its spiritual history. Nietzsche lived a century later, and in the meantime a great change had occurred, one which we are only now able to comprehend. It was his fate to come into the world after the Rococo period, and to stand amid the totally cultureless 1860s and 1870s. Consider the streets and houses he had to live in, the clothing fashions, furniture, and social mores he had to observe. Consider the way people moved about in social circles in his day, the way they thought, wrote, and felt. Goethe lived at a time filled with respect for form; Nietzsche longed desperately for forms that had been shattered and abandoned. Goethe needed only to affirm what he saw and experienced around him; Nietzsche had no recourse but to protest passionately against everything contemporary, if he was to rescue anything his forebears had bequeathed to him as a cultural heritage. Both of these men strove during their whole lives for strict inner form and discipline. But the eighteenth century was itself “in form.” It possessed the highest type of society that Western Europe has ever known. The nineteenth century had neither a distinguished society nor any other kind of formal attributes. Apart from the incidental customs of the urban upper class it possessed only the scattered remains, preserved with great difficulty, of aristocratic and middle-class tradition. Goethe was able to understand and solve the great problems of his time as a recognized member of his society, as we learn in Wilhelm Meister and Elective Affinities; Nietzsche could remain true to his task only by turning his back on society. His frightful loneliness stands as a symbol over against Goethe’s cheerful gregariousness. One of these great men gave shape to existing things; the other brooded over nonexisting things. One of them worked for a prevailing form; the other against a prevailing formlessness. Aside from this, however, form was something very different for each of them. Of all the great German intellectuals, Nietzsche was the only born musician. All the others — thinkers, poets, and painters alike — have either been shapers of material or have taken material apart. Nietzsche lived, felt, and thought by ear. He was, after all, hardly able to use his eyes. His prose is not “written,” it is heard — one might even say sung. The vowels and cadences are more important than the similes and metaphors. What he sensed as he surveyed the ages was their melody, their meter. He discovered the musical keys of foreign cultures. Before him, no one knew of the tempo of history. A great many of his concepts — the Dionysian, the Pathos of Distance, the Eternal Recurrence — are to be understood quite musically. He sensed the rhythm of what is called nobility, ethics, heroism, distinction, and master morality. He was the first to experience as a symphony the image of history that had been created by scholarly research out of data and numbers — the rhythmic sequence of ages, customs, and attitudes. He himself had music, just as he walked, spoke, dressed, experienced other people, stated problems, and drew conclusions. What Bildung had been for Goethe, was for Nietzsche tact in the broadest sense: social, moral, historical, and linguistic tact, a feeling for the proper sequence of things, made all the keener by his suffering in an age that had very little of this feeling. Like Zarathustra, Goethe’s Tasso was born of suffering, but Tasso succumbed to a feeling of weakness when challenged by a contemporary world which he loved and which he regarded as superior to himself. Zarathustra abhorred the contemporary world, and fled from it to distant worlds of the past and future. The inability to feel “at home” in one’s own time — that is a German curse. Because of the guilt of our past we came into bloom too late and too suddenly. Beginning with Klopstock and Lessing, we had to cover in eighty years a distance for which other nations had centuries. For this reason we never developed a formal inner tradition or a distinguished society that could act as guardian of such a tradition. We borrowed forms, motifs, problems, and solutions from all sides and struggled with them, whereas others grew up with them and in them. Our end was implicit in our beginning. Heinrich von Kleist discovered — he was the first to do so — the problematics of Ibsen at the same time that he strove to emulate Shakespeare. This tragic state of affairs produced in Germany a series of outstanding artistic personalities at a time when England and France had already gone over to producing literati — art and thought as a profession rather than a destiny. But it also caused the fragmentation and frustration expressed in much of our art, the thwarting of final aims and artistic thoroughness. Today we use the terms “Classical” and “Romantic” to denote the antithesis that appeared around 1800 everywhere in Western Europe, literary Petersburg included. Goethe was a Classic to the same extent that Nietzsche was a Romantic, but these words merely designate the predominant hues in their essential natures. Each of them also possessed the other potentiality, which at times urged its way to the foreground. Goethe, whose Faust-monologues and West-Eastern Divan are high points of Romantic sensibility, strove at all times to confine this urge for distance and boundlessness within clear and strict traditional forms. Similarly, Nietzsche often suppressed his acquired inclination for the Classical and rational, which held a twofold fascination for him by reason of temperament and philological profession, to what he termed the Dionysian, at least when he was evaluating. Both men were borderline cases. Just as Goethe was the last of the Classics, Nietzsche was, next to Wagner, the last of the Romantics. By their lives and their creations they exhausted the possibilities of these two movements. After them, it was no longer possible to render the meaning of the ages in the same words and images — the imitators of the Classical drama and the latter-day Zarathustras have proved this. Moreover, it is impossible to invent a new method of seeing and saying like theirs. Germany may well bring forth impressive formative minds in the future; however, fortunate for us, they will nonetheless be isolated occurrences, for we have reached the end of the grand development. And they will always be overshadowed by the two great figures of Goethe and Nietzsche. An essential characteristic of Western Classicism was its intense preoccupation with the contemporary world. While seeking to control human drives that tend in opposite directions, it attempted to make the past and the future coalesce in the contemporary situation. Goethe’s dictum about the “Demands of the Day,” his “cheerful present,” imply after all that he called upon various kinds of past figures and events — his Greeks, his Renaissance, Götz von Berlichingen, Faust, and Egmont — in order to infuse them with the spirit of his own time. The result is that when reading such works as Tasso or Iphigenia we are not at all mindful of historical precedent. Just the opposite is the case with the Romantics; their proper domain was remote places and times. They longed for withdrawal from the present to distant and foreign realms, to the past and future of history. None of them ever had a profound relationship with the things that surrounded him. The Romantic is enticed by whatever is strange to his nature, the Classic by what is proper to his nature. Noble dreamers on the one hand, noble masters of dreams on the other. The one type adored the conquerors, rebels, and criminals of the past, or ideal states and supermen of the future; the other type construed statesmanship in practical, methodical terms or, like Goethe and Humboldt, even practiced it themselves. One of Goethe’s great masterpieces is the conversation between Egmont and William of Orange. He loved Napoleon, for he was witness to his deeds in his own time and locality. He was never able to recreate artistically the violent personalities of the past; his Caesar went unwritten. But that is precisely the type of personality that Nietzsche worshipped — from a distance. At close range, as with Bismarck, he was repelled by them. Napoleon would also have repelled him. He would have seemed to him uncouth, shallow, and mindless, like the Napoleonic types that lived around him — the great European politicians and the rough-and-ready businessmen whom he never even saw, much less understood. He needed a vast distance between the Then and the Now in order to have a genuine relationship with a given reality. Thus he created his Superman and, almost as arbitrarily, the figure of Cesare Borgia. These two tendencies are tragically present in the most recent German history. Bismarck was a Classic of politics. He based his calculations entirely on things that existed, things he could see and manipulate. The fanatical patriots neither loved nor understood him until his creative work appeared as a finished product, until he could be romantically transfigured as a mythic personage: “The Old Man of the Saxon Forests.” On the other hand, Ludwig II of Bavaria, who perished as a Romantic and who never created or even could have created anything of enduring value, actually received this kind of love (without returning it), not only from the people at large, but also from artists and thinkers who should have looked more closely. Kleist is regarded in Germany with, at best, a reluctant admiration that is tantamount to rejection, particularly in those instances where he succeeded in overcoming his own Romantic nature. He is inwardly quite remote from most Germans, unlike Nietzsche, whose nature and destiny were in many ways similar to the Bavarian king’s, and who is instinctively honored even by those who have never read him. Nietzsche’s longing for remoteness also explains his aristocratic taste, which was that of a completely lonely and visionary personality. Like the Ossian-type Romanticism that originated in Scotland, the early Classicism of the eighteenth century began on the Thames and was later taken across to the Continent. It is impossible to consider it apart from the Rationalism of the same period. The Classicists engaged in the act of creativity consciously and deliberately; they replaced free imagination with knowledge, at times even with scholarly erudition. They understood the Greeks, the Renaissance, and inevitably also the world of contemporary active affairs. These English Classicists, all of them of high social standing, helped create liberalism as a philosophy of life as it was understood by Frederick the Great and his century: the deliberate ignoring of distinctions that were known to exist in the practical life but were in any case not considered as obstacles; the rational preoccupation with matters of public opinion that could neither be gotten rid of nor hushed up, but that somehow had to be rendered harmless. This upper-class Classicism gave rise to English democracy — a superior form of tactics, not a codified political program. It was based on the long and intensive experience of a social stratum that habitually dealt with real and practicable possibilities, and that was therefore never in danger of losing its essential congeniality. Goethe, who was also conscious of his social rank, was never an aristocrat in the passionate, theoretical sense — unlike Nietzsche, who lacked the habituation to regular practical experience. Nietzsche never really became familiar with the democracy of his time in all its strength and weakness. To be sure, he rebelled against the herd instinct with the wrath of his extremely sensitive soul, but the chief cause of his anger was to be found somewhere in the historical past. He was doubtless the first to demonstrate in such radical fashion how in all cultures and epochs of the past the masses count for nothing, that they suffer from history but do not create it, that they are at all times the pawns and victims of the personal will of individuals and classes born to be rulers. People had sensed this often enough before, but Nietzsche was the first to destroy the traditional image of “humanity” as progress toward the solution of ideal problems through the agency of its leaders. Herein lies the immense difference between the historiography of a Niebuhr or a Ranke, which as an idea was likewise of Romantic origin, and Nietzsche’s method of historical vision. His way of looking into the soul of past epochs and peoples overcame the mere pragmatic structure of facts and events. Yet such a technique required detachment. English Classicism, which produced the first modern historian of Greece in George Grote — a businessman and practical politician — was quite exclusively the affair of higher society. It ennobled the Greeks by regarding them as peers, by “present-ing” them in the truest sense of the word as distinguished, cultivated, intellectually refined human beings who at all times acted “in good taste” — even Homer and Pindar, poets whom the English school of classical philology was the first to prefer over Horace and Virgil. From the higher circles of English society this Classicism entered the only corresponding circles in Germany, the courts of the small principalities, where the tutors and preachers acted as intermediaries. The courtly atmosphere of Weimar was the world in which Goethe’s life became the symbol of cheerful conviviality and purposeful activity. Weimar was the friendly center of intellectual Germany, a place that offered calm satisfaction to a degree unknown by any other German writer, an opportunity for harmonious growth, maturing, and ageing that was Classical in a specifically German sense. Next to this career there is the other, which likewise ended in Weimar. It started out in the seclusion of a Protestant pastor’s home, the cradle of many if not most of Germany’s great minds, and reached its height in the sun-drenched solitude of the Engadin. No other German has ever lived such an impassioned private existence, far removed from all society and publicity — though all Germans, even if they are “public” personalities, have a longing for such solitude. His intense yearning for friendship was in the last analysis simply his inability to lead a genuine social life, and thus it was a more spiritual form of loneliness. Instead of the friendly “Goethe house” on Weimar’s Frauenplan, we see the joyless little cottages in Sils-Maria, the solitude of the mountains and the sea, and finally a solitary breakdown in Turin — it was the most thoroughly Romantic career the nineteenth century ever offered. Nevertheless, his need to communicate was stronger than he himself believed, much stronger at any rate than Goethe’s, who was one of the most taciturn of men despite the social life that surrounded him. Goethe’s Elective Affinities is a secretive book, not to speak of Wilhelm Meister’s Years of Wandering and Faust II. His most profound poems are monologues. The aphorisms of Nietzsche are never monologues; nor are the Night Song and the Dionysus Dithyrambs completely monologues. An invisible witness is always present, always watching. That is why he remained at all times a believing Protestant. All the Romantics lived in schools and coteries, and Nietzsche invented something of the sort by imagining that his friends were, as listeners, his intellectual peers. Or again, he created in the remote past and future a circle of intimates, only to complain to them, like Novalis and Hölderlin, of his loneliness. His whole life was filled with the torture and bliss of renunciation, of the desire to surrender and to force his inner nature, to bind himself in same way to something that always proved to be foreign to himself. Yet that is how he developed insight into the soul of epochs and cultures that could never reveal their secrets to self-assured, Classical minds. This organic pessimism of his being explains the works and the sequence in which they appeared. We who were not able to experience the great flourishing of materialism in the mid-nineteenth century should never cease to be amazed at the audacity that went into the writing, at such a tender age and contrary to the opinions of contemporary philological scholarship, of The Birth of Tragedy. The famous antithesis of Apollo and Dionysus contains much more than even today’s average reader can comprehend. The most significant thing about that essay was not that its author discovered an inner conflict in “Classical” Greece, the Greece that had been the purest manifestation of “humanity” for all others except perhaps Bachofen and Burckhardt. More important still was that even at that age he possessed the superior vision that allowed him to peer into the heart of whole cultures as if they were organic, living individuals. We need only read Mommsen and Curtius to notice the tremendous difference. The others regarded Greece simply as the sum of conditions and events occurring within a certain span of time and space. Our present-day method of looking at history owes its origin, but not its depth, to Romanticism. In Nietzsche’s day, history, as far as Greece and Rome were concerned, was little more than applied philology, and as far as the Western peoples were concerned little more than applied archival research. It invented the idea that history began with written records. The liberation from this view came out of the spirit of music. Nietzsche the musician invented the art of feeling one’s way into the style and rhythm of foreign cultures, aside from and often in contradiction to the written documents. But what did written documents matter anyway? With the word “Dionysus” Nietzsche discovered what the archaeologists eventually brought to light thirty years later — the underworld and the undersoul of Classical culture, and ultimately the spiritual force that underlies all of history. Historical description had become the psychology of history. The eighteenth century and Classicism, including Goethe, believed in “culture” — a single, true, mental and moral culture as the task of a unified humanity. From the very beginning Nietzsche spoke quite unforcedly of “cultures” as of natural phenomena that simply began at a certain time and place, without reason or goal or whatever an all-too-human interpretation might wish to make of it. “At a certain time” — the point was made clear from the very first time in Nietzsche’s book that all of these cultures, truths, arts, and attitudes are peculiar to a mode of existence that makes its appearance at one certain time and then disappears for good. The idea that every historical fact is the expression of a spiritual stimulus, that cultures, epochs, estates, and races have a soul like that of individuals — this was such a great step forward in historical depth-analysis that even the author himself was at the time not aware of its full implications. However, one of the things the Romantic yearns for is to escape from himself. This yearning, together with the great misfortune of having been born in that particular period in history, caused Nietzsche to serve as a herald for the most banal form of realism in his second book, Human, All-Too-Human. These were the years when Western Rationalism, after abandoning its glorious beginnings with Rousseau, Voltaire, and Lessing, ended as a farce. Darwin’s theories, together with the new faith in matter and energy, became the religion of the big cities; the soul was regarded as a chemical process involving proteins, and the meaning of the universe boiled down to the social ethics of enlightened philistines. Not a single fiber of Nietzsche’s being was party to these developments. He had already given vent to his disgust in the first of his “Untimely Meditations,” but the scholar in him envied Chamfort and Vauvenargues and their lighthearted and somewhat cynical manner of treating serious topics in the style of the grand monde. The artist and enthusiast in him was perplexed by the massive sobriety of an Eugen Dühring, which he mistook for true greatness. Priestly character that he was, he proceeded to unmask religion as prejudice. Now the goal of life was knowledge, and the goal of history became for him the development of intelligence. He said this in a tone of ridicule that served to heighten his own passion, precisely because it hurt to do so, and because he suffered from the unrealizable longing to create in the midst of his own time a seductive picture of the future that would contrast with everything he was born into. While the ecstatic utilitarianism of the Darwinian school was extremely remote from his way of thinking, he took from it certain secret revelations that no true Darwinist ever dreamed of. In The Dawn of Day and The Gay Science there appeared, in addition to a way of looking at things that was meant to be prosaic and even scornful, another technique of examining the world — a restrained, quiet, admiring attitude that penetrated deeper than any mere realist could ever hope to achieve. Who, before Nietzsche, had ever spoken in the same way of the soul of an age, an estate, a profession, of the priest and the hero, or of man and woman? Who had ever been able to summarize the psychology of whole centuries in an almost metaphysical formula? Who had ever postulated in history, rather than facts and “eternal truths,” the types of heroic, suffering, visionary, strong, and diseased life as the actual substance of events as they happen? That was a wholly new kind of living forms, and could have been discovered only by a born musician with a feeling for rhythm and melody. Following this presentation of the physiognomy of the ages of history, a science of which he was and will always be the creator, he reached to the outer limits of his vision to describe the symbols of a future, his future, which he needed in order to be cleansed of the residue of contemporary thought. In one sublime moment he conjured the image of Eternal Recurrence, as it had been vaguely surmised by German mystics in the Middle Ages — an endless circling in the eternal void, in the night of immeasurable eons, a way to lose one’s soul utterly in the mysterious depths of the cosmos, regardless of whether such things are scientifically justifiable or not. Into the midst of this vision he placed the Superman and his prophet, Zarathustra, representing the incarnate meaning of human history, in all its brevity, on the planet that was his home. All three of these creations were completely distant, impossible to relate to contemporary conditions. For this very reason they have exerted a curious attraction on every German soul. For in every German soul there is a place where dreams are dreamed of social ideals and a finer future for mankind. Goethe lacked such a corner in his soul, and that is why he never became a truly popular personage. The people sensed this lack, and thus they called him aloof and frivolous. We shall never overcome this reverie of ours; it represents within us the unlived portion of a great past. 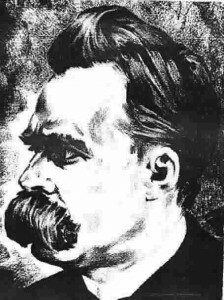 Once having arrived at this height, Nietzsche posed the question as to the value of the world, a question that had accompanied him since childhood. By doing so he brought to an end the period of Western philosophy that had considered the types of knowledge as its central problem. This new question likewise had two answers: a Classical and a Romantic answer or, to put it in the terms of the time, a social and an aristocratic answer. “Life has value to the same degree as it serves the totality” — that was the answer of the educated Englishmen who had learned at Oxford to distinguish between what a person stated as his considered opinion and what the same person did at decisive moments as a politician or businessman. “Life is all the more valuable, the stronger its instincts are” — that was the answer given by Nietzsche, whose own life was delicate and easily injured. Be that as it may, for the very reason that he was remote from the active life he was able to grasp its mysteries. His ultimate understanding of real history was that the Will to Power is stronger than all doctrines and principles, and that it has always made and forever will make history, no matter what others may prove or preach against it. He did not concern himself with the conceptual analysis of “will”; to him the most important thing was the image of active, creative, destructive Will in history. The “concept” of will gave way to the “aspect” of will. He did not teach, he simply pointed matters out: “Thus it was, and thus it shall be.” Even if theoretical and priestly individuals will it a thousand times differently, the primeval instincts of life will still emerge victorious. What a difference between Schopenhauer’s world view and this one! And between Nietzsche’s contemporaries, with their sentimental plans for improving the world, and this demonstration of hard facts! Such an accomplishment places this last Romantic thinker at the very pinnacle of his century. In this we are all his pupils, whether we wish to be or not, whether we know him well or not. His vision has already imperceptibly conquered the world. No one writes history any more without seeing things in his light. He undertook to evaluate life using facts as the sole criteria, and the facts taught that the stronger or weaker will to succeed determines whether life is valuable or worthless, that goodness and success are almost mutually exclusive. His image of the world reached its culmination with a magnificent critique of morality in which, instead of preaching morality, he evaluated the moralities that have arisen in history — not according to any “true” moral system but according to their success. This was indeed a “revaluation of all values,” and although we now know that he misstated the antithesis of Christian and master-morality as a result of his personal suffering during the 1880’s, nonetheless the ultimate antithesis of human existence lay behind his statement; he sought it, and sensed it, and believed that he had captured it with his formula. If instead of “master morality” we were to say the instinctive practice of men who are determined to act, and instead of “Christian morality” the theoretical ways in which contemplative persons evaluate, then we would have before us the tragic nature of all mankind, whose dominant types will forever misunderstand, combat, and suffer from each other. Deed and thought, reality and ideal, success and redemption, strength and goodness — these are forces that will never come to terms with one another. Yet in historical reality it is not the ideal, goodness, or morality that prevails — their kingdom is not of this world — but rather decisiveness, energy, presence of mind, practical talent. This fact cannot be gotten rid of with laments and moral condemnations. Man is thus, life is thus, history is thus. Precisely because all action was foreign to him, because he knew only how to think, Nietzsche understood the fundamental essence of the active life better than any great active personality in the world. But the more he understood, the more shyly he withdrew from contact with action. In this way his Romantic destiny reached fulfillment. Under the force of these last insights, the final stage of his career took shape in strict contrast to that of Goethe, who was not foreign to action but who regarded his true calling as poetry, and therefore restrained his actions cheerfully. Goethe, the Privy Councilor and Minister, the celebrated focal point of European intellect, was able to confess during his last year of life, in the final act of his Faust, that he looked upon his life as having attained fulfillment. “Tarry now, thou art so fair!” — that is a phrase expressive of the most blissful satiety, spoken at the moment when the active physical work is completed under Faust’s command, to endure now and forevermore. It was the great and final symbol of the Classicism to which this life had been dedicated, and which led from the controlled cultural education of the eighteenth century to the controlled exercise of personal talent of the nineteenth. Yet one cannot create distance, one can only proclaim it. Just as Faust’s death brought a Classical career to an end, the mind of the loneliest of wanderers vanished with a curse upon his age during those mysterious days in Turin, when he watched the last mists disappear from his image of the world and the highest peaks come ever clear into view. This puzzling final episode of his life is the very reason Nietzsche’s existence has had the stronger influence on the world ever since. Goethe’s life was a full life, and that means that it brought something to completion. Countless Germans will honor Goethe, live with him, and seek his support; but he can never transform them. Nietzsche’s effect is a transformation, for the melody of his vision did not end with his death. The Romantic attitude is eternal; though its form may at times be unified and complete, its thought never is. It will always conquer new areas, either destroying them or changing them radically. Nietzsche’s type of vision will pass on to new friends and enemies, and these in turn will hand it down to other followers and adversaries. Even if someday no one reads his works any longer, his vision will endure and be creative. His work is not a part of our past to be enjoyed; it is a task that makes servants of us all. As a task it is independent of his books and their subject matter, and thus a problem of German destiny. In an age that does not tolerate otherworldly ideals and takes vengeance on their authors, when the only thing of recognized value is the kind of ruthless action that Nietzsche baptized with the name of Cesare Borgia, when the morality of the ideologues and world improvers is limited more radically than ever to superfluous and innocuous writing and speech-making — in such an age, unless we learn to act as real history wants us to act, we will cease to exist as a people. We cannot live without a form of wisdom that does not merely console in difficult situations, but helps one to get out of them. This kind of hard wisdom made its first appearance in German thought with Nietzsche, despite the fact that it was cloaked in thoughts and impressions he had gathered from other sources. To the people most famished for history in all the world, he showed history as it really is. His heritage is the obligation to live history in the same way. First published in Spengler, Reden und Aufsätze (Munich, 1937).